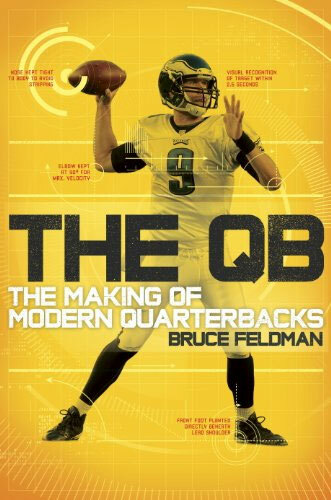 Note: The following is an excerpt from the book “The QB: The Making Of Modern Quarterbacks” by Bruce Feldman. Please note the old acronyms are used for each Brain Type (ESTP = #5 FEIR). In 1998, June Jones was in his first season as the San Diego Chargers quarterbacks coach and had spent months with his colleagues trying to sort out the dilemma facing them about which QB the organization wanted: Peyton Manning, the cerebral son of football great Archie Manning, or Ryan Leaf, the rocket-armed country kid from Montana who had just led Washington State to the Rose Bowl. Jones took a break from draft prep one night and turned on 20/20, the ABC newsmagazine show. It was featuring a man claiming to be an expert on brain-typing. The man, Jonathan Niednagel, is a lay scientist whose academic credentials are rooted in finance, not science or psychology. Niednagel was asked to size up Manning versus Leaf. He said one of the two guys has “It.” One doesn’t. “I said, ‘Are we going to take Ryan Leaf, even though we know he’s not one of those guys?’” Jones recalled. “He said, ‘Well . . .’ and then he hemmed and hawed and said something about how the owner made the call.” The Colts shrewdly drafted Manning first. The Chargers, against Niednagel’s suggestion, drafted Leaf, who wasted little time alienating his teammates. Leaf opened the season throwing just one touchdown pass and turned the ball over 15 times. Head coach Kevin Gilbride was fired after six games. Jones became the interim head coach. A few days after taking over the Chargers, Jones met Niednagel. After Week 9, which four teams are headed to the College Football Playoff? Our committee decides. Jones’ team, the Chargers, had just signed Leaf to a four-year, $31.25-million deal, including a guaranteed $11.25-million signing bonus, the most ever paid to an NFL rookie. Jones won his first game over a hapless Philadelphia Eagles team, 13–10, thanks to Natrone Means’ 112 rushing yards. San Diego won in spite of Leaf’s completing only nine passes but for the first time not committing a turnover. Jones had Niednagel “brain-type” his players at Hawaii and at SMU for more than a decade. Jones always had a list of seven or eight players for Niednagel to evaluate when the coach brought him out to his practices. The players were usually good athletes who should have won starting positions but hadn’t because they didn’t respond well, Jones said. Niednagel then gave him direction on what positional moves should be made to better fit each player to his more “natural” position. “[Maui’a] looked at me like I was crazy. But he lost a hundred pounds. I put him at running back, and he got drafted in the sixth round, and he’s still playing in the NFL. And he’d never played running back in his life. Niednagel said he could talk to a person and gauge how his mind was wired by his voice inflection and diction as well as by eyeballing his facial features. Niednagel, who worked out of a tiny south-central Missouri town (population: 453), was met with much skepticism from the science community, which took issue with the fact that he had no advanced scientific degree. Instead, he had a BS in finance from Long Beach State. But he was quick to point out that he’d had almost 40 years of research. He maintained that 60 percent of athletic ability came from personality type, and the other 40 percent stemmed from external factors, including how they were coached. He first started noticing the variances in motor skills when he coached his kids’ Little League soccer and baseball teams. Soon, he was testing out his theories. From USC to Oregon to Texas A&M, here’s a look at the top threads in the game right now. “I’d draft certain kids even though they’d never played before,” he said. “I’d talk to the kid. I knew that, by halfway through the season, just by my coaching him, he’d be better than a kid who’d looked 10 times better in the workout.” Niednagel, then living in Southern California, had so much success as a Little League coach there were stories about him in the Los Angeles Times. Word spread about Niednagel to pro sports teams always desperate for an edge. Niednagel loved his connection to the sports world. Even though the Celtics paid him a reported salary in the six figures, Jones had never actually paid him for his guidance. “I just fly him over,” Jones said. “Jon sensed that I got it, and he wanted to help, and that I was more open than any coach he’d ever talked to.” Jones, in his second season at SMU — after he’d led the Mustangs to their best season in 25 years — tried to get Niednagel hired as a professor in the Sports Management department. E-extraverted versus I-introverted. F-feeling versus T-thinking. J-judging versus P-perceiving. N-iNtuitive versus S-sensing. Niednagel tweaked the verbiage and came up with his own terminology, which he officially went with in 2011 when he published a book about parenting. Extraverted (E) became Front (F); Introverted (I) became Back (B); Sensing (S) became Empirical (E); iNtuitive (N) became Conceptual (C); Feeling (F) became Animate (A); Thinking (T) became Inanimate (I); Perceiving (P) became Right (R); Judging (J) became Left (L). Niednagel also reduced the profiles even further with numbers, as if the players were dishes off a fast-food menu. “ESTP,” the type Peyton Manning is, became “FEIR” — Front Empirical Inanimate Right — or a No. 5. “I took it out of that bogus Myers-Briggs world and tried to take it into the brain and what it’s really representing,” Niednagel said. Jones could rattle off the names of all the great quarterbacks who were ESTPs (FEIRs): Joe Montana, John Elway, Johnny Unitas, Joe Namath, Jim Kelly, Troy Aikman, Terry Bradshaw, Fran Tarkenton and Brett Favre. An eye-catching majority of the Hall of Fame quarterbacks who played in the past 30 years are this one personality type. So were other Super Bowl–winning quarterbacks Ken Stabler, Phil Simms, Joe Theismann and Trent Dilfer. Jones used the famous NFL Films anecdote of Montana — the moment before beginning a last-minute, game-winning, touchdown drive in the Super Bowl, walking into the huddle and matter-of-factly pointing out John Candy in the crowd to one of his linemen as an example of a guy wired to thrive under pressure. “ESTPs, under pressure, play their best,” said Jones. “I had this conversation with [former Denver Broncos head coach] Dan Reeves. He wanted to get rid of John Elway. He said Elway couldn’t learn the playbook. But guess who was so great in the two-minute drill? John Elway. Guess who was calling all the plays then? John Elway. The latter is a key point that both Jones and Niednagel stressed. As much as it was ideal to find an ESTP quarterback, it was vital to ID what kind of personality type your QB had, so you could alter accordingly how you coached the guy. Jones was stunned when he learned that Tom Brady wasn’t ESTP (a No. 5) but rather an ENFP (a No. 9). ENFPs typically are too smart and empathetic to thrive as quarterbacks, because they have so much exuberance and passion. Jones actually was the Falcons’ offensive coordinator when the team drafted Favre in the second round in 1991. Favre lasted one season in Atlanta before he was traded to Green Bay. He attempted four passes, had two of them intercepted, and the other two went incomplete. “Type No. 13s are typically the ace on baseball pitching staffs, but their wiring isn’t optimum for quarterbacks,” Niednagel said. Still, it seemed that as the NFL was becoming more open to mobile QBs, more and more No. 13s were thriving. Aaron Rodgers was a No. 13, and so were Andrew Luck, Russell Wilson, Colin Kaepernick and Robert Griffin III. Even if, as Niednagel said, ESTPs do recoil at structure, many of them have proven to be some of the world’s greatest leaders. Winston Churchill, Teddy Roosevelt, FDR, George S. Patton, Douglas MacArthur — all were ESTPs. So were Malcolm X, Dale Carnegie, L. Ron Hubbard and Ernest Hemingway. Studies estimate that somewhere between 4 and 10 percent of the population are ESTPs.